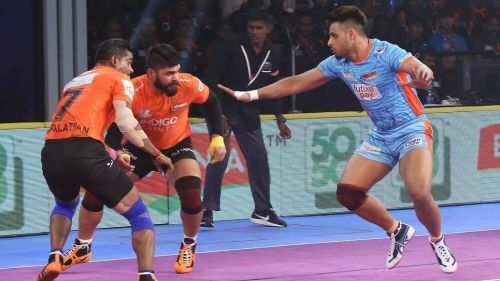 The second match of the opening day of the Panchkula leg of the competition as the Bengal Warriors faced off against the Tamil Thalaivas in action from the Zone B of the Pro Kabaddi League. The two sides were in the running for the playoffs spot but Bengal Warriors were in a better position at the fourth spot with their home leg approaching next week and wanted a win to get close to the Telugu Titans above them on the table. Tamil Thalaivas were in the bottom spot on the Zone B table and had to get a win tonight to have a chance of making the playoffs. Both the teams came into the match on the back of a couple of losses and hoped to get a crucial win. The match was a closely contested affair in the first half as the two teams played on their defensive strengths. Maninder Singh and Ajay Thakur picked up a few points but were kept in check by the defenders on either team. A low scoring half ended at 11-10 in favour of the Bengal Warriors. The second half started with the Warriors slightly edging ahead keeping Ajay Thakur on the bench for a long time. Surjeet Singh picked up his 'High 5' with his classic blocks from the cover position. Amit Hooda was the lone man in the Tamil Thalaivas lineup who looked in fine touch and finished with seven tackling points. Tamil Thalaivas ended up losing the match and their chance of making the playoffs as they lost 28-21 to the Warriors. The experienced cover defender handled the Warriors' defensive line well and was at his vintage best with his timely blocks on the Thalaivas raiders. He picked up his 'High 5' on the night and ended with six tackle points. The skipper of the Bengal Warriors tonight operated on the left corner and had one tackle point in the first half. He did a bit of raiding in the second half and picked up two crucial touch points in the final minutes of the match. The cover defender from Bangladesh was started tonight in the defence but had a quiet first half. He managed to get one tackle point in the second half with a strong dash. The young right corner defender was targeted on multiple occasions by the Tamil Thalaivas' raiding unit and leaked a few raid points. He did better in the second half picking up two tackle points with strong body holds. The all-rounder operated as the third raider alongside Maninder Singh and Jang Kun Lee for the Bengal Warriors. He did not have much success during his time on the mat and was substituted in the second half. The star raider of the Warriors lineup was in fine touch tonight and picked up five raid points in the first half of the match with his powerful raiding. He had a comparatively quiet second half and added just two more points finishing with seven raid points. The South Korean international was back in the lineup of the Bengal Warriors after a long time. He had a quiet first half picking up one bonus point and put in four empty raids. He added another bonus point in the second half finishing the match with two raid points. The substitute came off the bench whenever Bengal were down in numbers. He was impactful whenever he came on scoring a stellar four-point Super Raid in the second half.